Three Skoltech students have taken on a challenge to translate a scientific movie from English to Russian. The film, titled “Beyond Discipline”, is now screened all across Russia as part of the FANK festival of contemporary feature-length scientific films. “Beyond Discipline” is a project of scientific group of Edinburgh University (Scotland), in which they try to discuss the importance and benefits of interdisciplinary work in science. The film is following the project through a series of interviews with the most interesting representatives of science, education and art of Edinburgh. Two key guests are featured in the film – Peter Higgs, a theoretical physicist, the 2013 Nobel Prize Winner, and Richard Morris, a neurobiologist, the 2016 Brain Prize Winner. The film shows all aspects of interdisciplinarity including positives outcomes as well existing problems and demonstrates a significant demand on interdisciplinary projects for solution of huge modern problems with which humanity faces. The film was made by Paul Maguire and Sasha Kangasky. Kagansky contacted his friend Anton Krotov, a Skoltech biomed student, and offered him to translate the film for the occasion of the FANK festival. Krotov jumped on the offer and recruited his colleagues Artem Baranovskii and Yulia Mitina, who gladly accepted the challenge. “Sasha (Kagansky) offered me to work on the film together, because last year we already worked on the organization of “Future of Biomedicine 2015” conference in Vladivostok, with participation of invited scientists from Edinburgh University. “Before I decided to get the work, I watched the film and it seemed pretty interesting to me, with a lot of interesting invited guests for interviews. Not every day you have an opportunity to translate a new film with Peter Higgs, Nobel Prize Winner in physics, have you? I also thought that to do this job will be good practice in English learning. “At first, we transcribed all talks to English subtitles and only then we translated it to Russian. The process was interesting but not easy, because this is a documentary film. You do not find actions of actors but talks with real people, which sometimes express their thoughts in indirect ways. Nevertheless, it was good exercise for us on how to recognize Scottish accent in speeches of interviewees”. Apart from the process of translation, we asked Anton to relate to the content of the film, and explain why people, especially Skoltech students, should watch the film. “”Beyond discipline” discusses the role of interdisciplinarity in our world and there are several good examples of the perfect application of interdisciplinarity for solutions of some big problems”, he replies, “The filmmakers try to convince you that if you want solve a problem, you should go out from your discipline and meet and work with other people from different fields. I suppose that interdisciplinarity is the one of the key features which education at Skoltech tries to provide. This film is a good example that this feature is really important for accomplishment of success in your work. Some talks in “Beyond discipline” can inspire you to go out of your area of knowledge and try to do something new, something interdisciplinary. “I hope that in future we could collaborate more with any scientific filmmakers, because it is a good type of projects related with building a relationship between science and art. I am sure that Skoltech students can be interested in such interaction as well as different artists, filmmakers and other specialists. And Skoltech could become a perfect platform for any interdisciplinary projects where science, art and other field can work together”. “Now you are facing the new stage of your life” – welcome Skoltech Class of 2018! In late July, an American student of Bucknell University, Ksenia Tsoktoeva completed her internship at Skoltech. 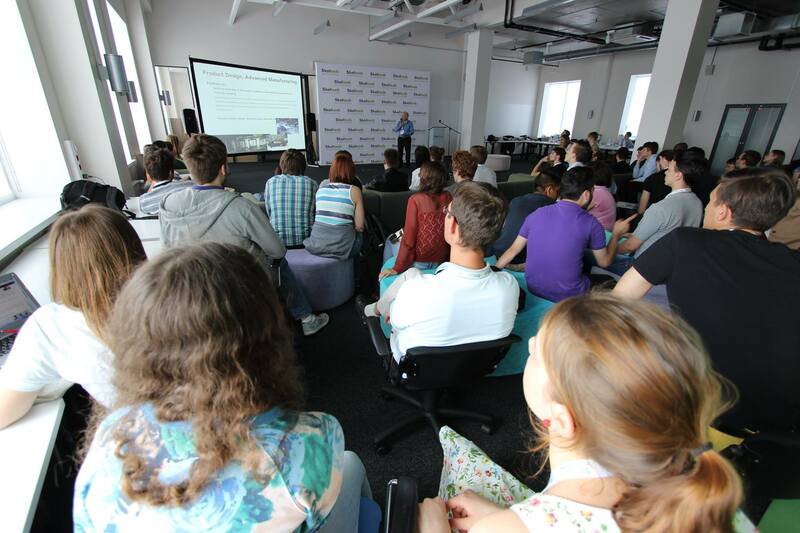 On July 15, in front of colleagues from the Laboratory of Robotics, Ksenia made her presentation. Skoltech students and graduates, AKA “Skoltech Martians 2.0″, are going to defend their project of a two-person flyby past the “Red Planet”, at the international competition of students’ works, organized by The Mars Society. Recruitment Days 2016 are over. Who will be selected?